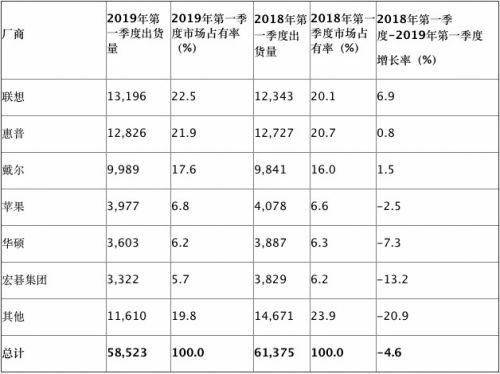 Gartner analysis, the growth is mainly attributed to Lenovo's inclusion in Fujitsu shipments in the second quarter of 2018 after the acquisition. Lenovo shipments have increased in Fujitsu's high market share areas such as Europe, Africa and the Middle East (Europe, Africa, Middle East; EMEA) and Japan. HP's global PC shipments increased by 0.8% in the first quarter of 2019 compared with the same period last year, while desktop computers increased, but notebook computers remained flat. HP's shipments in Europe, Africa and the Middle East increased slightly, but declined elsewhere. Dell recorded five consecutive quarters of growth in PC shipments in the first quarter, including Europe, Africa, the Middle East, Latin America and Japan, but declined in North America and the Asia-Pacific region. In addition, Apple PC shipments in the first quarter were 3.977 million units, down 2.5% year-on-year. Intel executives interpret Q1 earnings report: 10 nanoscale chips will be shipped in large quantities next year. Samsung's Q1 profits fell by 60% in 2019. The era of high profits in the chip industry will never return.